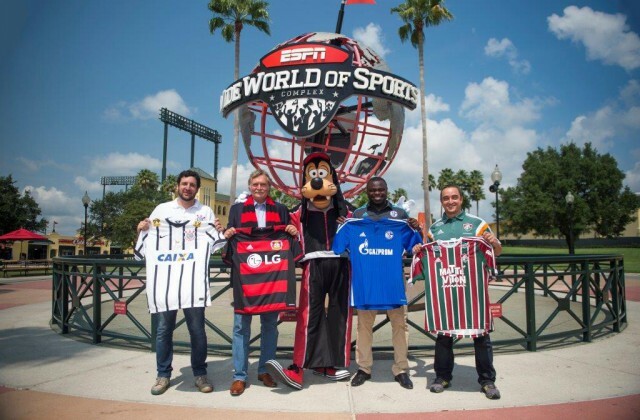 The Florida Cup soccer tournament is once again coming to the ESPN Wide World of Sports Complex in 2016. Next year’s tournament will once again feature two-time FIFA World Champion SC Corinthians, four-time Brazilian Champion Fluminese FC, and Champions League club Bayer 04 Leverkusen. New for 2016 is the five-time German Cup Champion FC Schalke 04. The 2016 Florida Cup will also include a panel discussion with club and league representatives covering soccer-related topics. Next year’s tournament is part of a bigger relationship between Disney and 2SV Sports. The agreement between Disney and 2SV Sports means the ESPN Wide World of Sports Complex is the official venue for the tournament. Last year’s Florida Cup was broadcast in 127 countries. In all there are 11 soccer events at the ESPN Wide World of Sports Complex including the Disney Soccer Showcase, the Disney Soccer Academy, the Disney Cup International, the Disney 3v3 Soccer Championship, and the Disney President’s Day Soccer Festival. The 2016 Florida Cup tournament is January 9-21.